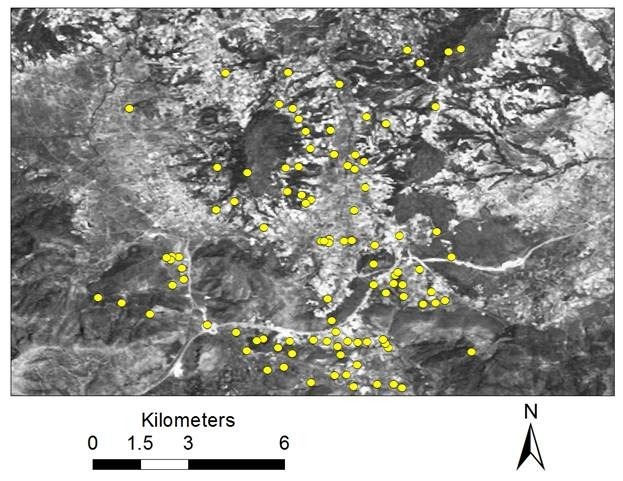 Chris Cloke continues his three-part series today on the interpretation of Greek and Roman artifact patterns in the Nemea Valley. If you’re just joining in, start by reading Part 1. 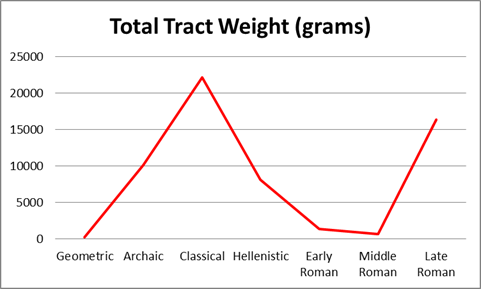 In this, the second of three posts looking at survey data from the Nemea Valley Archaeological Project (NVAP), I’ll be delving further into the world of manure and looking at ways in which survey finds can be used to examine past agricultural practices. In the interest of minimizing the effort required by transporting manure from pits or heaps around farms, villages, and towns to the fields it was used to fertilize, it was prudent to remove any large intrusions (such as big potsherds) before this was attempted. Arrian’s Discourses of Epictetus (II.IV.1-8) offer anecdotal evidence that small bits of pottery abounded on heaps of manure. Likening an adulterous person to a pot, Epictetus allegedly remarked, “If you were a vessel so cracked that it was impossible to use you for anything, you would be cast forth upon the dunghills and even from there no one would pick you up.” Thus, scholars have assumed (and some have demonstrated through ethnographic work) that the sort of artifacts typically transported among manure tend to be small and light. So in the course of my work, I began recording the survey’s pottery in such a way as to test these assumptions about manure, its contents, and what this stuff might look like after the organic materials had long since decayed. NVAP’s collection strategy was twofold: for intensive survey tracts (covering the totality of the walkable landscape) all sherds seen by fieldwalkers were counted. Those deemed to have any diagnostic properties (whether true diagnostics like vessel rims, or simply body sherds whose clay fabric might indicate what they were and when they were produced) were saved, studied, and stored in the Nemea Museum. When survey teams encountered “sites” (recognized by architectural or other clear remains, or set off by abnormal concentrations of artifactual material), more painstaking collection in grid squares or along transects was made, resulting in a fuller sampling of surface material. Intensive survey tracts in the NVAP study area (C. Cloke). Sites identified by NVAP (C. Cloke). Phlius is represented by the yellow dot at the upper left, while Mt. Foukas (ancient Mount Apesas) is at the upper right. The Nemea Valley is the light gray area in the center, and the modern highway from Corinth to Tripolis can be seen cutting across the lower half of the map. By weighing each sherd found in the rural tracts walked by NVAP, I was able to observe patterns in the types of material found away from sites, and to compare these patterns to those of site finds. Artifacts found on sites are assumed to have been used and eventually discarded in the general vicinity of their findspots, while finds from tracts may have reached their current positions in a variety of ways, including through manuring. 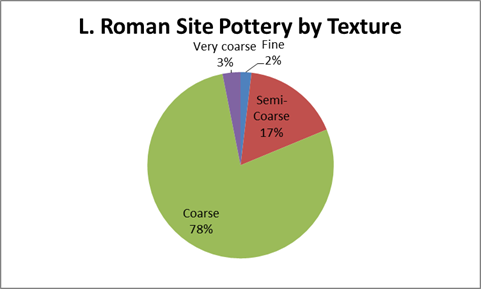 Thus, the expectation would be that, if manuring were taking place on any noteworthy scale, pot-sherds found away from sites would be, on average, lighter than the finds made at sites, because site finds would represent normal use and discard patterns, and tract finds (to some extent) would consist of the smaller bits of pottery not weeded out from manure before its use as fertilizer. 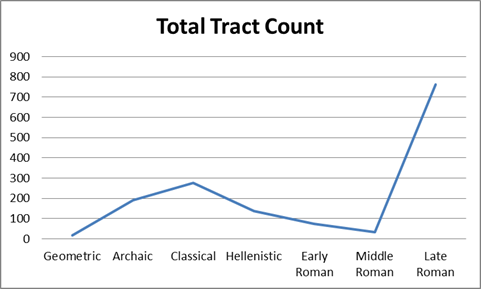 The number of sherds found in tracts peaks clearly in the Late Roman period, but is also stronger than usual in the Classical period, an observation which is borne out in the breakdown by weight (wherein Classical pottery was the heaviest group as a whole). 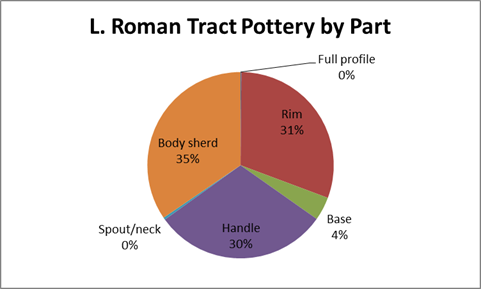 While tract pottery of the Early, Middle and Late Roman periods (1st century BC to 7th century AD) is discernibly lighter than the on-site finds of the same periods, the opposite is true of earlier periods; in the Classical period in particular (5th to 4th centuries BC), tract pottery was slightly heavier on average than site pottery. In other words, during the Roman era around Nemea, bigger, heavier sherds were found on the surfaces of sites where pots were being used, while lighter, more broken-up sherds were common throughout the countryside. 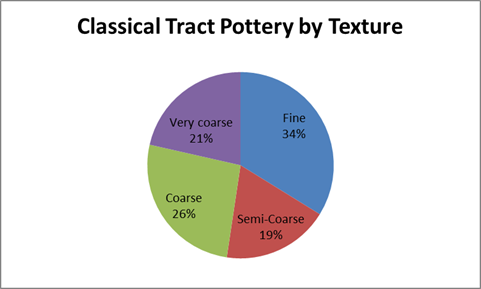 Yet these types of patterns can be influenced by all manner of variables (frequency of fine vs. coarse wares among the sample, relative proportions of various sherd types – rim, handle, base, body-sherd – or changes in the classes of vessels represented – e.g., 10 sherds from large storage pithoi will weigh far more than 10 sherds from drinking cups). Thus, breaking these variables down on a period-by-period basis served as a means of checking this general pattern and of eliciting other important trends in the data. In the interest of keeping these posts relatively brief, I’ll focus primarily on the Classical and Late Roman periods, when off-site finds peak. 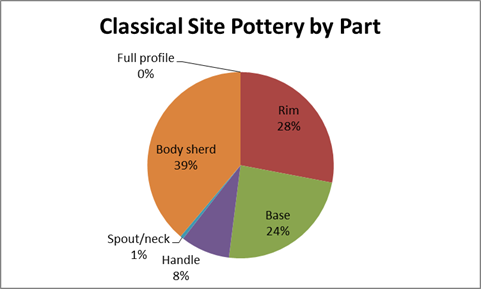 One notable trend is that there was a higher proportion of coarse and very coarse Classical pottery found off-site than on-site. 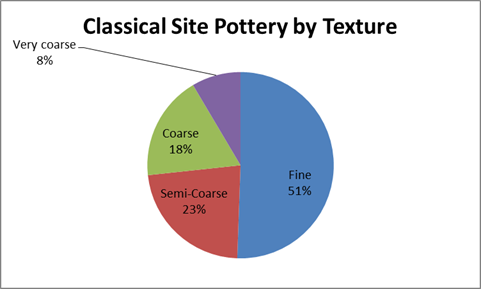 A preponderance of coarse wares goes some way toward explaining why off-site finds were slightly heavier, since coarser pottery is generally thick-walled and clunky. For one thing, the tract finds of this period include a slightly higher percentage of rims (making them heavier), but they also have a higher percentage of body sherds (making them lighter on average). 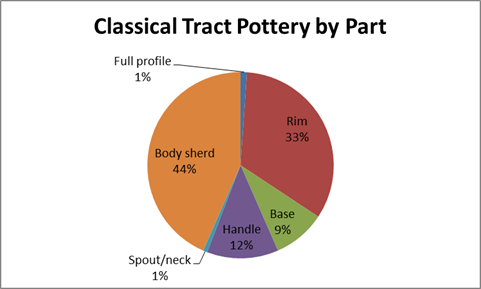 More handles than among site finds (heavy), and fewer bases (fairly light), make the Classical tract finds heavier on the whole. 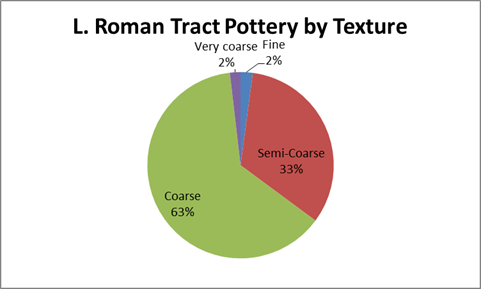 … although the distinction between semi-coarse and coarse wares can be blurry. In both cases, there were very low percentages both of fine and of very coarse wares, which are the ones most likely to skew the data one way or the other. Tract finds contained fewer rims and more body sherds (skewing them lighter), but also more handles (skewing them back toward the heavier end). 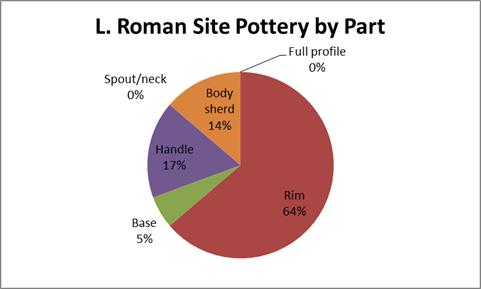 Yet the 35% of body sherds (the lightest category) among the Late Roman tract finds was lower than the 44% of body sherds among Classical tract finds (the peak in average weight for off-site ceramics!). Clearly, these breakdowns do not tell the whole story. In part 3, tomorrow, I’ll be looking at the functional variety of these finds and begin to tie together these various patterns into a working explanation of the off-site survey finds.